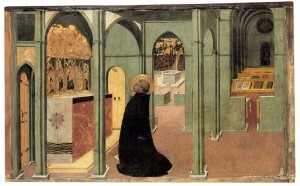 I think of the work of Stefano di Giovanni di Consolo, known as il Sassetta (1392 – 1450) as quiet and contemplative but full of layers, as in this image of St. Thomas Acquinas. The main event is right up front, but then the eye begins to wander this way and that and into the deep spaces. It never goes far without encountering some new shape, some variation, some richness. 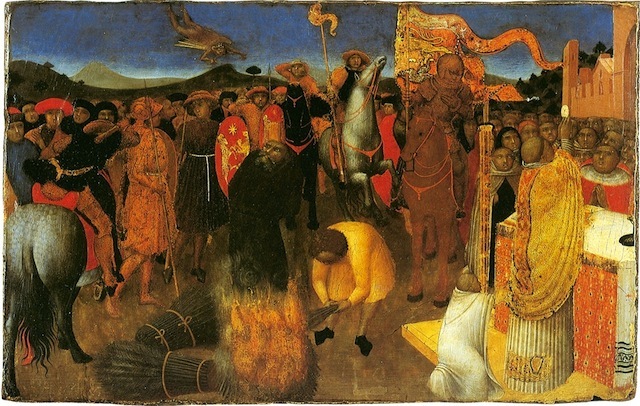 And then there is his amazing “Burning of a Heretic.” You wouldn’t call it contemplative, but there is a reserved quality to it, an almost anthropological dispassion. There is discovery and richness, but instead of shapes and spaces, here Sassetta observes types. The heretic and the horse in the center are the only parties who seem to be taking the event seriously. The spectators are calm, the soldiers uninvolved, the flock of chubby priests (Sassetta’s little dig?) off on their own head trip. The fire tender is quietly absorbed in his work, oblivious to the substance of the action.